Just as political revolutions took place from the end of the eighteenth century through the middle of the nineteenth, social revolutions occurred in the same sixty-year period in both fashion and the dance, the change in the latter being from communal country dancing to individual couples dancing. The waltz and the polka, both of which originated on the Continent, arrived forty years apart in England. Both revolutionized English notions of dancing by introducing close contact between a single pair of male and female dancers — in contrast to traditional country dances that involved elaborate patterns of movement for groups of dancers. The officers of the King's German Legion stationed at Bexhill, Surrey, introduced the waltz during the wars with France at the end of the eighteenth and beginning of the nineteenth century. Shortly after its introduction there in 1804 it became fashionable in ballrooms throughout Regency Britain. A similar mania characterized the introduction of the polka from Prague by way of Paris where, in 1840, a dancing instructor named Raab first danced the polka at the Odeon Theatre. By 1844 the Bohemian polka was being danced in society ballrooms, eclipsing the forty-year supremacy of the waltz. In this decade three new major couples dances appeared in England: the Polka, Mazurka, and the Schottische; new arrivals also included the Schottische, Valse à Deux Temps, Redowa, Five-Step Waltz, and Varsouvienne, and a new variation of the Galop. At the same time, the new ease of movement and emphasis on naturalness in dancing reduced the popularity of such figure dances as the Quadrille, reducing the performance of country dances to mere walking through the figures. This revolution in dance, then, involved a movement away from community and precise social order or hierarchy towards the individual performance, from, that is, eighteenth-century decorum towards romanticism. The waltz, for example, always involved a number of couples on the floor at any one time. It was not a display piece intended for the consumption of observers. The waltz has no group figures; rather, the dancers follow a circular track around the dancing area with the partners constantly turning as they make the circuit, making full use of the available dancing space. Below: From the Gin Shop to the Dancing Rooms, from the Dancing Rooms to the Gin Shop, the Poor Girl is Driven on in That Course Which Ends in Misery. (glyphography). 1848. George Cruikshank's third illustration for The Drunkard's Children. Although politically a pronounced radical, the sexuality inherent in the illustration suggests that Cruikshank, born in the eighteenth century, regarded the new couples dances as somewhat licentious in the intimate contact that dances such as the waltz and the polka required. Click on image to enlarge it. What matters here is not so much the date of composition as the era in which the illustration is set. 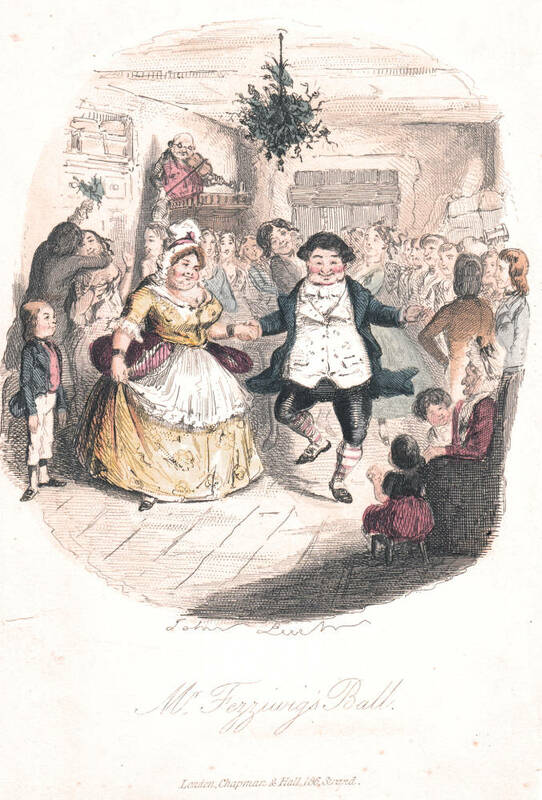 In Leech's frontispiece Mr. Fezziwig's Ball for A Christmas Carol the country-dance in the Fezziwig warehouse constitutes a flashback to the Regency, when Ebenezer Scrooge and Jacob Marley were young clerks at Fezziwig & Co. The communal dance is conducted in the time-honoured way with the employer and his wife (substituting for the local squire and the mistress of the estate) at the top of Sir Roger de Coverley while the rest of the company falls in behind, according to their social status. Goldie Morgentaler identifies the decade of transition in modes of dancing in England as the 1840s, as seen particularly in Dickens's Christmas Books: “Dickens not only uses the dance to suggest all the positive values associated with good feeling and sociability — the very things missing from Scrooge's life — but also allows his prose to echo the actual rhythm of the dance, so that sound and sense work together to convey the message to both the reader and Scrooge that dancing is a pleasurable, life-affirming, socially positive activity. . . . 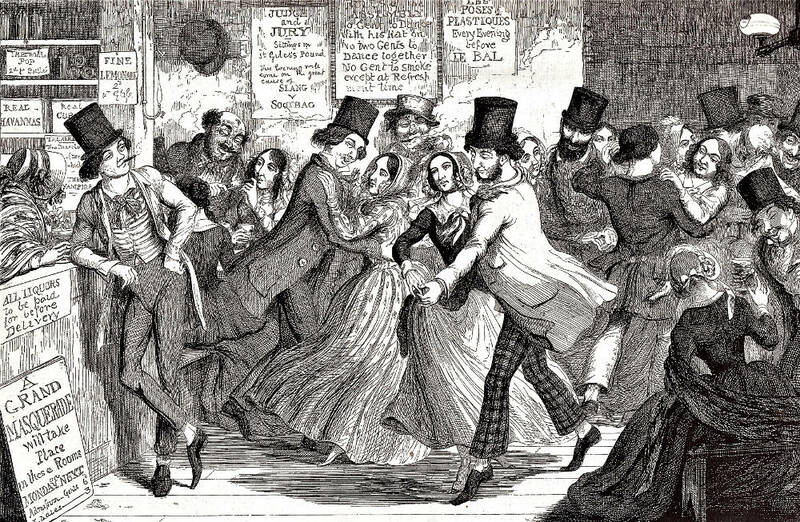 While Dickens's juxtaposition of dancing and social misery antedates the 1840s, . . . A Christmas Carol  and The Battle for Life , depict dance as simultaneously a life-affirming activity and a deflection of the decade's more serious social, medical and economic ills” (253). The same sort of country-dance, in which well-dressed couples are on parade in Among Those Who Danced Most Continually Were the Two Engaged Couples, occurs in Thomas Hardy's "The History of the Hardcomes" in Wessex Folk, published in 1891 but recalling the era of the Napoleonic wars. The radical change in dancing in the 1840s clearly appears in Barnes's illustration for Hardy's The Mayor of Casterbridge, published in 1886 but recalling the Dorchester of forty years earlier. The romantic Scot, Donald Farfrae, performs a couples dance that involves individual footing in Farfrae was footing a quaint little dance with Elizabeth Jane. Dickens, Charles. The Battle of Life: A Love Story. 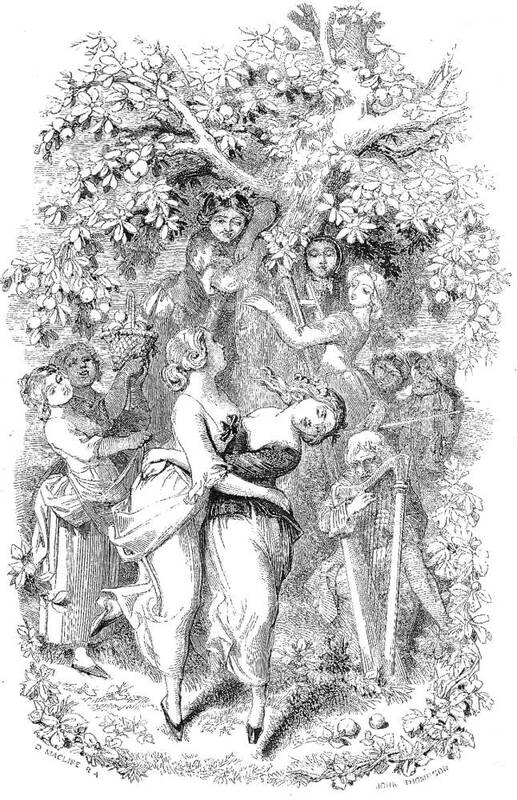 Illustrated by John Leech, Richard Doyle, Daniel Maclise, and Clarkson Stanfield. London: Bradbury and Evans, 1846. Dickens, Charles. A Christmas Carol. Illustrated by John Leech. London: Chapman and Hall, 1843. Morgentaler, Goldie. "Dickens and Dance in the 1840s." Partial Answers: Journal of Literature and the History of Ideas. Vol. 9, No. 2 (June 2011), pp. 253-266. Temperley, Nicholase. "Dance Music." Victorian Britain: An Encyclopedia. Ed. Sally Mitchell. New York & London: Garland, 1988. Page 208.